85/159 David Mumpower What can I say? I am a cat person. The Toy Story reference is great stuff, though. Proving that there are very few original ideas circulating in Hollywood these days, Disney once again mines one of its classic franchises for a 21st century re-imagining. 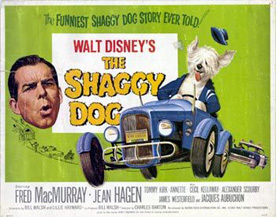 This time around, it's The Shaggy Dog, a movie that was originally released in 1959 and starred Fred MacMurray and inspired a sequel featuring Dean Jones and Suzanne Pleshette. It is this sequel, The Shaggy D.A., that will provide the bulk of the storyline for a new sheepdog story, with Tim Allen taking on the primary role. In the original Shaggy D.A., the story centered on a successful lawyer who is trying to be elected District Attorney in place of the crooked John Slade. The thing is, he keeps turning into a sheepdog at inopportune moments. The cause for his canine transformation is a missing ring that has been stolen from his home. As long as he has the magic ring in his possession, he can control his doggy nature, which means that he'll have to try to get it back before he blows the election. For this new update, Allen will portray a lawyer who is so devoted to his career, his attention to his family suffers. Soon, though, he is unexpectedly turning into a sheepdog, and while it causes him difficulties in his career, he does learn to be a better father and husband. Kristen Davis will play Allen's wife, with Craig Kilborn playing a neighbor. Danny Glover will play his boss, and Robert Downey Jr. will play an entrepreneur who is experimenting with dogs to create a miracle drug that he hopes will increase human life spans by seven years for each human year. See the latest developments for this project on the The Shaggy Dog Movie News page. Supporting Cast Craig Kilborn, Danny Glover, Robert Downey Jr.